Say hi to Coal for me, Ibraham. Haha, it’s pretty obvious now. Thank you! Haha! Oh wow, I can see that. That would be impressive, but Ibrahim has enough trouble learning real languages! I nearly fell off my chair laughing! He’ll be saying a lot of things! Say hi to Hedda for me, Ibrahim. Also good luck. Hahaha! He’s gonna need that luck. Say good-bye to your mother in Greek, Latin and Arabic. You’re going on an adventure! Your last sentence made me think of the Hobbit. Come to think about it, Ibrahim is in kind of the same position, you know, all “scared” about trips and voyages and all, than Bilbo. Hence yhe wonderful etails we have from the intrepid Southern travellers about the Norse people and a lot of misunderstanding too about so many culture clashes. There certainly were clashes. And there’s going to be at least a few more when Ibrahim meets Coal. I see a lot of “say hi to [character name]” comments, and nobody remembered Rollo? Well, either way, Ibrahim, say hi to Rollo. This is going an odd direction… So Uziar is right there when Coal stole something from his nephew… Who noticed Coal doing the stealing. This is gonna be problematic. Rollo ? Who it he ? …Well, I suppose that verifies my thought. Anyway, he’s the figurehead of the ship. Coal is nothing if not problematic. I think Ibrahim’s pop could probably kill somebody with that nose. What better way to learn new things? New languages, new stories, strange scrolls and volumes filled with ancient lore in all the foreign cities of the wide world. And then to bring it all back home. Also, the opportunity to get saddle sores, sun stroke and hurl over the side of the ship in all the tossing seas you have to cross to get there, but hey, it’s not all gravy, is it? I highly doubt that Coal speaks Greek, Latin, or Arabic. HILARITY ENSUES. And possibly jazz hands. Why is it that people always seem to do jazz hands when they can’t communicate? To imagine Coal doing Jazz Hands is hilarious indeed. Hopefully it won’t resort to that. But that would probably involve Coal smiling, y’know, that action that’s a prelude to Ragnarok? Not to Ibrahim it’s not! 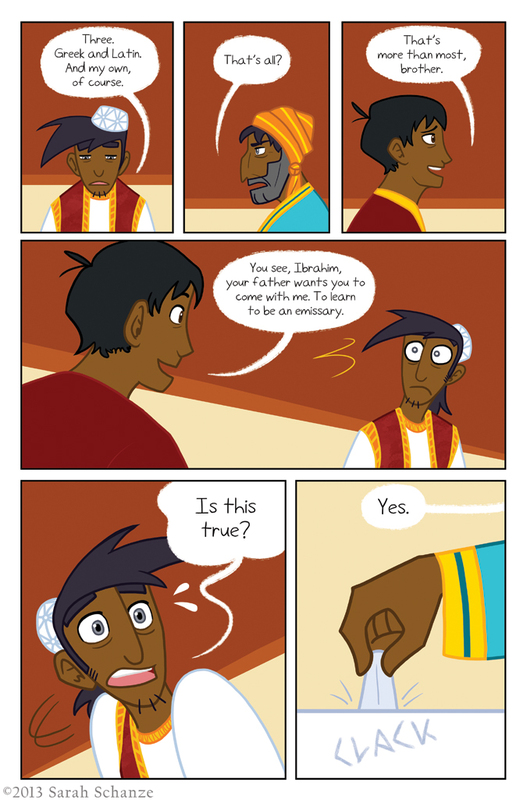 See, I didn’t really know the definition of “emissary”, so when I saw Ibrahim’s face in panel four I thought maybe his uncle was suggesting something really really horrible and it was extra funny for me. Anyway, nice page! Can’t wait to see Ibrahim’s decision. Ah, I miss the medieval Islamic world. So cultured, so educated. A beacon of civilization and knowledge in an otherwise degenerate and ignorant continent. And now look at it. You ask me, Islam peaked WAY too early.